Singapore is not yet done with nation building and its fourth generation of leaders must "fire up and mobilise" young Singaporeans who are eager to take up the challenge of forging a better future, said President Halimah Yacob. In a speech billed as the younger leaders' vision of the direction in which they want to take the country, Madam Halimah said that as a new generation of Singaporeans comes of age, the 4G leaders will have to work with them to respond to the challenges of their times. "They dream of a bright future, and pour their energies into exploring fresh horizons and building a better world. They want to see their parents age well," she said in her inaugural address as Parliament reconvened yesterday after a five-week half-time recess. "They hope for a fairer and more equal society. As proud Singaporeans, they want to see this small island nation stand tall among the community of nations." She said the 4G leaders "must grow with the people they represent, be open to diverse views and ideas, and have a clear purpose and unity of action". They have to earn the right to lead and forge bonds with citizens, she said. "That right cannot be inherited. The trust between the people and their leaders is not automatically passed on from one generation to the next." Pointing to the challenges ahead, she continued: "Their duty is clear, but the path will not be easy. There will be times of hardship, when they must demonstrate leadership and resolve. There will be moments of truth, when they have to stand firm on principles and ideals while seeking practical resolutions. "They will need to listen to the views and feelings of the people, and by their words and deeds, show that they have heard; yet never fear to lead and mobilise public opinion to support difficult policies in the long-term interest of Singapore." The 30-minute speech, which in broad strokes sets out the Government's priorities for the second half of the term, was largely drafted by the younger Cabinet members - and mediocrity was not on the cards. "We may be tempted not to go for bold changes, but instead be content to tweak things at the margins," said Madam Halimah, noting that the new leaders may feel there is more to lose now, as Singapore is at a more advanced stage of development. "That would be the wrong approach," she said. Looking ahead, there are five priorities, she said. They are: Securing a place in the world for Singapore, building a world-class city, developing a vibrant economy, forging a caring and inclusive society, and nurturing a distinct Singapore identity. The President, flanked by Speaker of Parliament Tan Chuan-Jin and Chief Justice Sundaresh Menon, representing the different branches of government, was addressing a packed chamber in Parliament House. There were signs of political transition all round. Following a Cabinet reshuffle that took effect this month, the front bench was filled with key 4G ministers such as Finance Minister Heng Swee Keat, Trade and Industry Minister Chan Chun Sing, Education Minister Ong Ye Kung, Manpower Minister Josephine Teo, Minister in the Prime Minister's Office Ng Chee Meng, and Minister for Social and Family Development Desmond Lee, while retired 3G ministers Lim Hng Kiang, Lim Swee Say and Yaacob Ibrahim moved to the second row. On the other side of the aisle, new Workers' Party secretary-general Pritam Singh took the front-row seat of his predecessor Low Thia Khiang, the de facto leader of the opposition for nearly two decades who stepped down last month. In the public gallery sat the family members of MPs. Taking stock of the Government's work over the previous 32 months, Madam Halimah described it as an eventful time. She noted that Singapore has managed to grow its economy and real wages for all income groups. But she added that the Republic remains vulnerable to external developments, be it the ties between China and the United States, or the threat of terrorism. The texture of society is also changing, and Singapore should be wary of divisive forces such as inequality and religious polarisation. In an uncertain world, leadership will decide Singapore's success, said the President. Ending her address on a spirited note, she said she hoped Singaporeans born post-independence will understand that "becoming Singaporean - 'one united people, regardless of race, language or religion' - continues to be an undertaking of conviction and choice". She urged them to dedicate themselves to writing the next chapter of Singapore's story. "Together, the new generation will keep Singapore an exceptional nation." Inequality is an issue the Government will tackle "vigorously" as it strives to build a fair and just society based on meritocracy, while leaving no one behind, President Halimah Yacob said yesterday. This was one of five key priorities that she outlined in her inaugural address at Parliament, where she set out the Government's agenda for the second half of its term. The President highlighted four other major priorities - securing Singapore's place in a changing world; building a well-connected, world-class city; developing a vibrant economy with good jobs and nurturing a Singaporean identity. People in Singapore must always be able to get ahead through effort and excellence, regardless of their backgrounds, she said. "We must open up more progression pathways and celebrate a broader range of successes," she said, adding that the right support - in housing, education, skills training and employment - must be provided to those who need it. Building an inclusive society also means the Government will have to pay special attention to the growing population of elderly people, including by continuing to help older workers stay employed so that they can age with dignity and purpose. Young families will get more help to cope with the cost of living, while people with disabilities must be enabled to lead full and active lives, Madam Halimah said. On top of that, Singaporeans want to feel a strong sense of nationhood, she noted. "That is why we are prepared to participate in and enlarge our common space, while preserving and practising our own ethnic cultures." Singapore has succeeded in nurturing a distinct identity, where its people share a sense of common destiny that transcends individual racial and religious identities, she said. "This is still a work in progress, but we have come far." Madam Halimah also set out what Singapore is doing to secure its place in the world, including upholding international law and championing free trade to counter rising protectionism around the globe. The Republic seeks to be friends with as many countries as possible, and will work for good relations with both the United States and China in particular , she added. At home, the Singapore Armed Forces and Home Team are building up their capabilities to handle unconventional threats like terrorism and cyber attacks. To build a world-class city, she said, the Government will invest in infrastructure like Changi Airport Terminal 5 to keep Singapore one of the best-connected cities in Asia - a hub and conduit for the flow of goods and services, capital and people, as well as information and knowledge. "A far-reaching transformation of Singapore's cityscape will take shape in the coming decades," she added, pointing to land that will be freed up for development when Paya Lebar Airbase moves to Changi and the city ports move to Tuas. For Singapore to remain a nation of opportunities, the Government is prepared to adapt to changing economic conditions, embrace technology and continually upgrade the skills and knowledge of its people, Madam Halimah said. Companies will play a major role in economic restructuring, she noted. "We will build a strong base of local firms with the capabilities to succeed both at home and abroad." The Government will also invest heavily in Singaporeans, she added. "In an age of technological disruption, Singaporeans must be flexible, eager to learn and adventurous to venture beyond our shores," she said. "We are changing the way we educate and prepare Singaporeans for life, putting less emphasis on academic grades, and more on skills and the ability to adapt to a dynamic external environment." Political analysts and young Singaporeans interviewed last night said they are looking forward to how the fourth-generation leaders intend to make "bold changes" to address the challenges facing Singapore, and added that the devil will be in the details. But for now, they are certain of this: They welcome the call by President Halimah Yacob for strong steps to confront the uncertain future coming Singapore's way, rather than merely tweaking things at the margins. Mr Goh Jing Rong, 25, a second-year doctoral student in finance at Nanyang Business School, said: "With future changes and disruption, there is a need for calculated boldness, or else there is no progress." 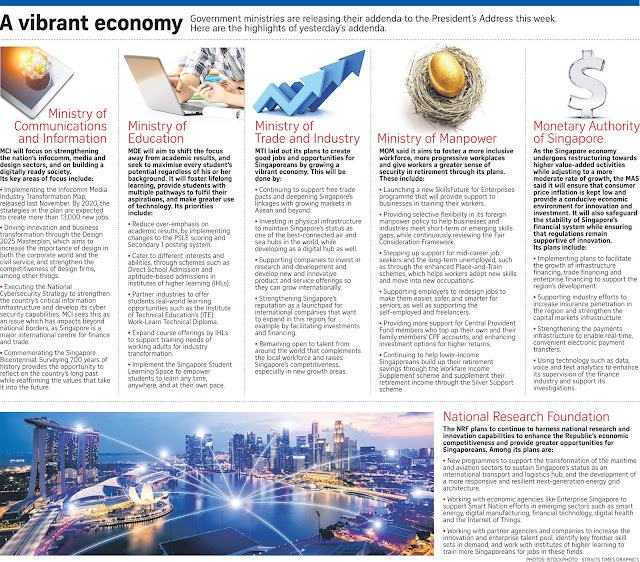 Those interviewed also noted a stepped-up focus on social inequality, with Madam Halimah spelling out the need to relook academic pathways, housing, skills training and employment. This is an issue that interests many younger Singaporeans, said five young people after watching the President's speech. The topic resonated most with community worker Muhammad Afzal Abdul Hadi, who witnesses the differences between the haves and the have-nots on a daily basis. "There is a pressing need to make our meritocracy become more meritocratic," said the 22-year-old, who said he would like to see more resources given to social service organisations. Institute of Policy Studies deputy director of research Gillian Koh, whose research findings on social inequality earlier this year helped put the issue back on the public radar, applauded the recognition of the issue. But she wondered how a solution could be operationalised, she said. "Each generation of leaders has the opportunity to tackle this problem, so let us have an articulation in the coming weeks on what bold and innovative ideas the 4G team will have," she added. 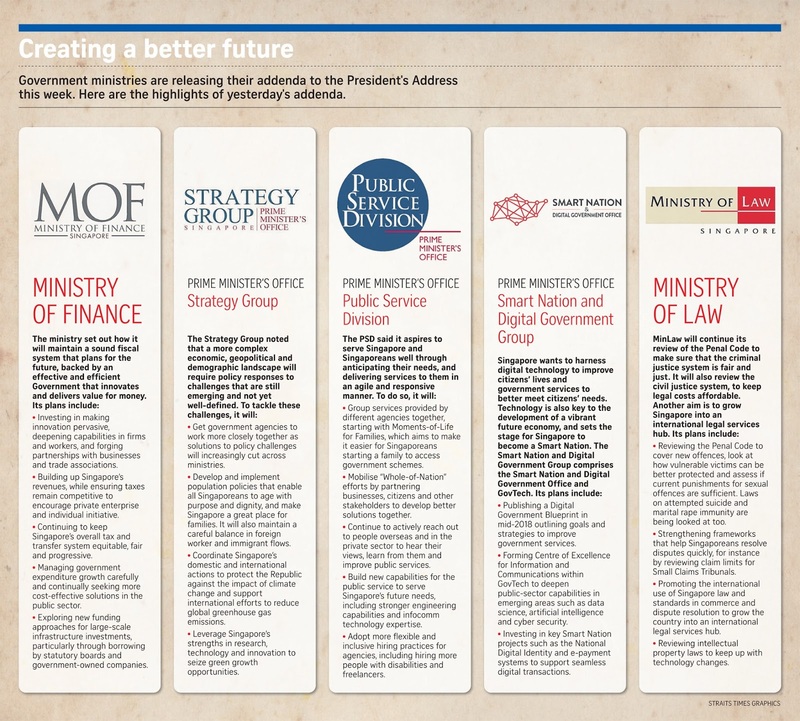 Starting today, ministries will be releasing their plans for the remaining half of the term. More details are also expected next week, when eight ministers, in addition to Prime Minister Lee Hsien Loong, will speak when Parliament meets to debate the President's Address. Another key point raised yesterday by Madam Halimah was that this new team of leaders will need to "earn the right to lead", instead of simply inheriting the mandate from their predecessors. This will be a key challenge for the 4G leaders, several MPs told The Straits Times. Minister of State for National Development and Manpower Zaqy Mohamad noted, for instance, that the task of building a common Singapore identity has evolved, as younger Singaporeans have different aspirations that may not be based on material needs. For example, feelings of rootedness used to be fulfilled by home ownership, but nowadays some may not be inclined to buy homes, he said. "We have to see how the social compact between Singaporeans and the Government changes, moving forward." Asked if 4G leaders can convince Singaporeans to support difficult and unpopular policies, Bishan-Toa Payoh GRC MP Saktiandi Supaat said he believes so, as Singaporeans are more educated and understand policy trade-offs. "I believe they will be able to work well with Singaporeans, going forward," he added. Mr Mohamed Irshad, 28, founder of interfaith harmony group Roses of Peace, said he would like to see ministers understand what youth are going through and better communicate policies across. "Young people are practical and pragmatic as a bunch, and their uncertainties are over employment and what may be rising costs of living," said Mr Irshad. Picking up on Madam Halimah's point on how 4G leaders should be unafraid to lead public opinion to support difficult policies, comparative politics researcher Felix Tan of SIM Global Education saw this as a warning against populism to win over the new generation. MPs interviewed also gave their takes on the bold changes that they wanted to see. Mr Ang Hin Kee (Ang Mo Kio GRC) said he wanted to see steps to ensure that good jobs are not only "the privilege of those who are younger and more digitally aware", but available to older workers too. For Dr Chia Shi-Lu (Tanjong Pagar GRC), addressing social inequality is key. "The problem is not so much with gaps now, but there are unequal bits, like a road which is paved but is maybe not as smooth as it could be," he said. "If we don't look at these things in the near term or the mid-term, in the long-term they will create bigger and bigger problems for society." Ms Lee Bee Wah (Nee Soon GRC), meanwhile, said she would like to see bold moves towards encouraging more mixing across different groups in society. She said: "How can we ensure that our people continue to mix together and that economic class, race or religion do not become dividing points?" Ms Denise Phua (Jalan Besar GRC) said that while she does not believe in making bold changes just for the sake of doing so, she does want to see fresh ideas in areas such as education. "The idea of education for life, education that goes beyond the boundaries of time, age and school walls and so forth - that is very appealing to me and I feel that is the way to go," she said. Boldness is a high-wire act. When a move that entails major risk is made, because no incremental change is likely to serve as an adequate remedy in the face of an unprecedented challenge, it is often called bold if it succeeds. If it fails, other labels may take its place: reckless, hubristic, or impatient. At Parliament's reopening last night, the fourth-generation ministers decided not to mince words in their maiden outing as a team. For the first time, they were given free rein to draft the President's Address, which sets out the Government's agenda for the rest of the term. They chose to place on record a promise not to be hampered by caution or to simply run the system on autopilot. On the contrary, the speech they crafted said: "We may feel that we have more to lose now. We may be tempted not to go for bold changes, but instead be content to tweak things at the margins. That would be the wrong approach." It was a bold statement about being bold. In making it, the 4G leaders set a high bar for themselves. If they make no bold changes over the next 2½years, the speech may return to haunt them. If they embark on major changes that fail or involve a lot of short-term pain that can't be soothed in time, there will also be a cost to pay. But if they pull it off, they can take Singapore decisively into its next phase of development. That the 4G leaders have chosen to kick off their big game with a statement about significant change speaks to their confidence. The first three generations opted for bold moves which paid off. The 1G leaders acquired vast tracts of land by force and embarked upon the world's biggest public housing programme. They gambled on a relatively unconventional development strategy then - a focus on exports, led by multinational corporations - and won. They built Changi Airport, and a container seaport before containers became ubiquitous. The 2G leaders led the argument for a Mass Rapid Transit system and then made it happen. They risked the wrath of workers by reducing Central Provident Fund contributions amid a recession to tide Singapore over. They loosened political control by forging a kinder, gentler society with a more consultative state. The 3G leaders overturned decades of political wisdom by allowing casinos. They also moved resolutely to the left of centre by introducing Workfare Income Supplement for low-wage workers, the Pioneer Generation Package and MediShield Life. Many years from now, when it is the turn of the 5G or 6G leaders to take over, what will people look back to as the bold moves that the 4G leaders were responsible for? Will these moves leave a mark? Speaking to The Straits Times at Parliament House yesterday, those who heard the address had some ideas and suggestions. Businessman and grassroots leader Sam Goi, also known as the Popiah King, wants Singapore to boldly forge free trade agreements. "Is the first sacred cow that is going to be slaughtered the PSLE?" asked Nominated MP Mahdev Mohan, referring to the Primary School Leaving Examination, which some say is a reason schools are too stressful and too focused on academics. Other MPs - Mr Louis Ng (Nee Soon GRC) and Mr Liang Eng Hwa (Holland-Bukit Timah GRC) - said they wanted to see greater audacity in tackling the problem of inequality. Inequality does seem an obvious place to start, since it was highlighted as a major problem in yesterday's speech. But change should not happen for change's sake. Here, the 4G leaders should also take heed from big moves their predecessors tried to make that did not succeed - such as the Graduate Mothers Scheme and the Stop At Two policy. Providing pragmatic balance, Dr Lily Neo (Jalan Besar GRC) said yesterday: "I always err on the side of, 'If it ain't broken, don't fix it'. We must do things that are doable and that will benefit everybody." The 4G leaders showed they understood this logic, for this need for balance in leadership came through when the speech delved into the challenges that will come their way. This was also where the rhetoric of the speech was at its most stirring and rhythmic. It laid out four "yets" or "buts" - as the 4G leaders gave a hint of their leadership style and showed that they were cognisant of the dangers of running towards extremes. Leaders, they said, should embrace a diversity of views and ideas - "yet forge a clarity of purpose and unity of action". Leaders should listen to the views and feelings of the people - "yet never fear to lead and mobilise public opinion to support difficult policies in the long-term interest of Singapore". Leaders should uphold Singapore's six foundational values - multiracialism, meritocracy, incorruptibility, self-reliance, inclusivity and openness to the world - yet not be afraid to make changes in the spirit of pioneers. Finally, leaders should understand that "their duty is clear, but the path will not be easy". "There will be times of hardship... There will be moments of truth, when they have to stand firm on principles and ideals while seeking practical resolutions." The President's Address is not meant to be a clear statement of policy. That is for each minister to articulate over the next two weeks, in the addenda to the speech and during the debate over the address. But the address is a statement of intent. It is also a statement of what the overall position, stance and tone of the 4G leaders will be. Singaporeans will now have to decide if these statements can be the basis of a long-term relationship which will see the people and the leaders - as the speech said - "go through trials and tribulations together, and forge... bonds afresh". This journey - which is the real test of leadership - begins today. In her inaugural President's Address yesterday, Madam Halimah Yacob pledged again to serve all Singaporeans, regardless of their race or background. She noted that the Constitution had been amended "to reflect our multiracial values, by ensuring that all ethnic groups have a chance to be represented in the highest office in the land". She was honoured to serve as the first Malay president in 47 years, after the Republic's first president, Mr Yusof Ishak, she added. "I renew today the pledge that I made when I took my oath of office in September last year: I will serve every Singaporean regardless of race, language or religion." 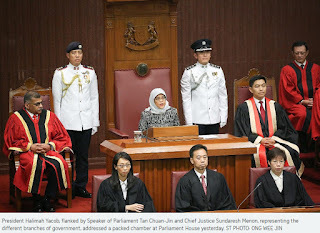 Madam Halimah was elected last September, following constitutional changes to reserve elections for groups that have not held the presidency for some time. The presidential election last year was reserved for Malay candidates and the former Speaker was the sole eligible candidate, becoming Singapore's first woman president. Yesterday, she also promised to safeguard Singapore's reserves and ensure they are drawn upon properly - only under exceptional circumstances, or for other "very good reasons". In a reference to the Budget delivered by Finance Minister Heng Swee Keat in February, she said the Government had to make some tough choices. Among the announcements this year was a controversial goods and services tax (GST) hike to 9 per cent, to take place some time from 2021 to 2025. Some critics had called for more of the reserves to be used instead. 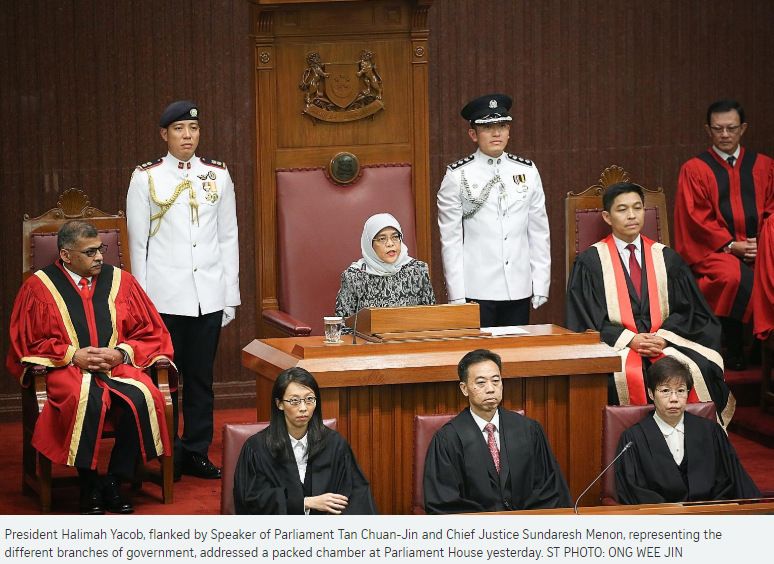 In her inaugural address to Parliament yesterday, President Halimah Yacob focused on the challenges and priorities of a new generation of leaders as they and fellow Singaporeans undertake a new phase of nation building. Here is her address. In January 2016, shortly after the SG50 year, my predecessor, President Tony Tan, opened the 13th Parliament. Dr Tan reviewed how far we had come as a nation. He renewed our commitment to keep Singapore an exceptional nation, with a thriving economy and a caring and inclusive society. We are now midway through the current term of government. It has been an eventful 32 months: The United States elected a new president; the Chinese Communist Party held its 19th National Congress; the United Kingdom voted to leave the European Union; and ISIS (the Islamic State in Iraq and Syria) became a significant menace, though it has since been dealt a severe blow. Singapore has navigated a steady path amid an uncertain external environment. We deepened our engagement with neighbours, as well as major global powers. We advocated free trade against rising protectionism, and helped to conclude the Comprehensive and Progressive Agreement for Trans-Pacific Partnership. We continued to uphold Asean centrality and unity. We have done well at home too. The economy recorded steady growth, especially in 2017, which we hope will extend into 2018. Real wages rose steadily for all income groups. We are making progress in renewing our economy. The Government, industries and unions are partnering one another to implement the recommendations of the Committee on the Future Economy. We upgraded and extended our infrastructure. We opened Changi Terminal 4, launched 46,000 new BTO (Build-To-Order) units, completed the addition of 1,000 more buses and opened new MRT lines. We sped up the upgrading of the North-South and East-West MRT lines. We are improving the reliability of our trains. We continued to strive for a more caring and inclusive society. We strengthened education at all levels - from pre-school for toddlers to lifelong learning opportunities for all ages. We enhanced social safety nets and provided more support for the vulnerable - from KidStart for at-risk young children to Silver Support for seniors who had earned low incomes. The Singapore spirit shone bright. We rejoiced when Joseph Schooling won Singapore's first Olympic gold medal, and when Yip Pin Xiu and Theresa Goh triumphed at the Rio Paralympics. We celebrated NS50 and saluted over a million national servicemen who have served their nation through the decades. The National Gallery opened to the public, including a permanent exhibition of the unique Nanyang style of painting. We amended the Constitution to reflect our multiracial values, by ensuring that all ethnic groups have a chance to be represented in the highest office in the land. I am honoured to serve as the first Malay President in 47 years after Encik Yusof Ishak. I renew today the pledge that I made when I took my oath of office in September last year: I will serve every Singaporean, regardless of race, language or religion. This year's Budget was a far-reaching one. We had to take some difficult decisions. These steps were necessary to strengthen our long-term fiscal position, ready us for an ageing population, and fund infrastructure investments on a sustainable basis. As your President, I will safeguard our reserves and ensure that they are drawn upon properly and only under exceptional circumstances, or for other very good reasons. Our island-nation is doing well. The Government is fulfilling the tasks it set out to accomplish; relations with partners around the world are good; people live harmoniously with one another; and economic prospects are bright. But do not assume that Singapore will always continue to be successful. There are significant developments in our external and domestic environments that we must understand and deal with. First, strategic changes. The centre of gravity of the world economy is shifting to Asia, as a result of China rising and India taking off. Asean, our immediate neighbourhood, is generating renewed interest among international investors. These trends bode well for Singapore. But much depends on the relationship between the US and China, which underpins regional and global peace and prosperity. Both powers have high stakes in maintaining a stable and healthy relationship. However, their relationship is a dynamic one. As China's strength grows and America's interests evolve, both sides will need to manage the inevitable rivalries and disagreements, and exercise foresight and restraint. Trade frictions are just one aspect of US-China bilateral tensions that affect the rest of the world - especially small, open economies like ours. Second, regional tensions. The Korean peninsula is currently seeing fresh and positive developments, but it is a complex problem with a long history. Negotiations towards a peaceful resolution and ultimately, the denuclearisation of the peninsula, will be complex and difficult. Terrorism remains a clear and present danger. ISIS has lost the military battle in Iraq and Syria, but the extremist ideology behind it has not been eradicated. South-east Asian fighters who joined ISIS in the Middle East may return home to mount attacks in and around their home countries. Singapore is a target. We must stay vigilant and united, and never allow a terrorist attack to cause discord and distrust among us. In particular, we must be careful of the dangers of online self-radicalisation. Closer to home, relations with our immediate neighbours - Malaysia and Indonesia - are stable and multi-faceted. Our histories and heritages are intertwined. We have grown our partnerships in recent years, and will continue to strengthen them. We must tend these bilateral relationships carefully, especially during election seasons, and avoid becoming embroiled in their domestic politics. Third, domestic developments. The texture of our society is changing as our population ages. This will place heavier demands on our healthcare and social security systems. We have seen income inequality and social stratification break the social compact in many countries. If the same happens to us, our politics will turn vicious, our society will fracture and our nation will wither. We must tackle inequality, particularly the increasingly dissimilar starting points of children from different family backgrounds, before the problem becomes entrenched in our society. Religious polarisation, xenophobia and extreme nationalism are also divisive forces that have grown stronger in many parts of the world. The cyber space is being used to spread falsehoods and misinformation, and to sow distrust within societies. We must not allow our nation to succumb to these forces. All these developments that I have outlined can affect us in unexpected ways. We need to watch them closely, tackle them resolutely, and make progress together. We already have policies and programmes to respond to these shifts. These tasks will occupy us beyond this term of government. In the meantime, the fourth-generation leadership team is taking shape, and taking on more responsibilities. 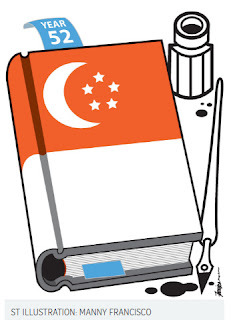 They will have to confront the question: "What is next for Singapore?" Like their predecessors, the fourth-generation leaders will uphold our foundational values - multiracialism, meritocracy, incorruptibility, self-reliance, inclusivity and openness to the world. They recognise the constants of Singapore's existence. A small, multi-cultural city state, with no natural resources, in the heart of South-east Asia, must survive and thrive on the wits and will of its people. 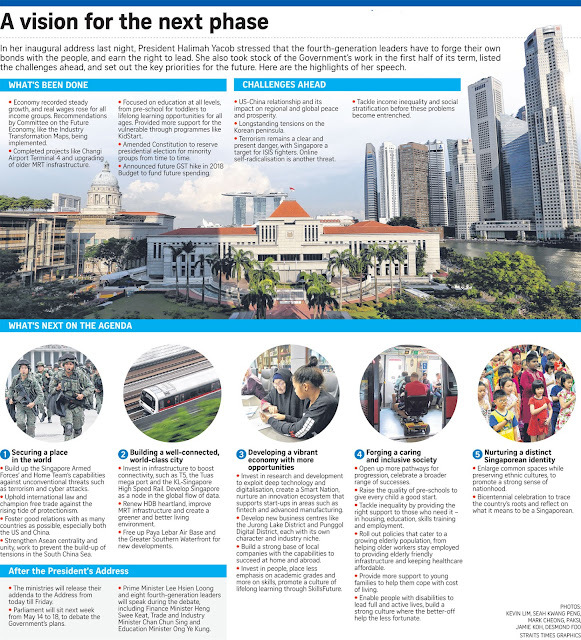 At the same time, the new leaders are conscious that Singapore is at quite an advanced stage of development. We may feel that we have more to lose now. We may be tempted not to go for bold changes, but instead be content to tweak things at the margins. That would be the wrong approach. Singapore has a lot going for it. It is a vibrant global node in the heart of a thriving Asia; a multi-cultural society with people from diverse backgrounds living harmoniously side by side. We need to keep alive the spirit of our pioneers and be constantly driven to do better, with each generation surpassing the previous. 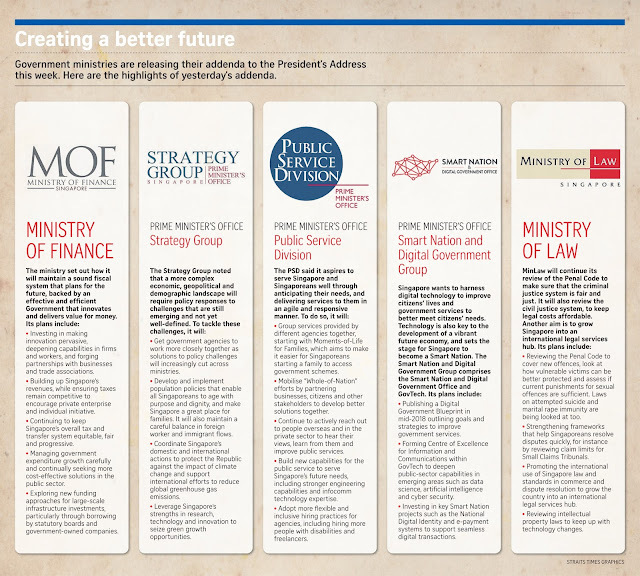 The fourth-generation leaders will work with fellow Singaporeans to undertake the next phase of nation building. Together, they will build upon what earlier generations accomplished. They will fashion new ideas and fresh approaches to confront a different future. We are beginning to see the imprint of the new leadership in developing and implementing public policies. Over time, these policies will be elaborated, refined, and will produce results. The work has begun, and will intensify from the second half of this term of government. Let me outline the key priorities. First, we want to secure Singapore's place in this changing world. To do so, we are prepared to stand and fight for our nation, defend our vital interests, and work with others in win-win partnerships. The Singapore Armed Forces and Home Team are steadily building up their capabilities, including against unconventional threats like terrorism and cyber attacks. Beyond equipment and capabilities, our strength ultimately lies in our people's resolve to defend this country and be masters of our destiny. As a small globalised city, we must uphold international law and the role of supranational institutions. Against the tide of rising protectionism, we must champion free trade, and explore new opportunities to collaborate with others. We seek to be friends with as many countries as possible. In particular, we will work for good relations with both the US and China. The US has been a constructive and stabilising presence in the region for the past 70 years. It remains an important strategic partner for Singapore. We cooperate with the US in many areas, and will enhance this cooperation in the years ahead. Our relationship with China is deep and productive. Through China's four decades of reform and opening up, generations of leaders in both countries have worked closely together. We will continue to collaborate with China in its next phase of development, including participating in the Belt and Road Initiative. In South-east Asia, we will strive for an open and inclusive regional order, with all the major powers engaged. We will work with regional partners to strengthen Asean centrality and unity, and do our part to prevent the build-up of tensions in the South China Sea. This year, we are the Asean chair, but we will sustain our efforts for the long term. Second, Singaporeans want to live in a world-class city and an endearing home - clean, green and efficient; fun and connected; and we are prepared to think long term in planning our city and infrastructure, and building for future generations. We will invest in infrastructure to keep Singapore one of the best connected cities in Asia, a hub and conduit for the flow of goods and services, capital and people, information and knowledge. We are building Changi Airport Terminal 5 and a new Tuas Port. The Kuala Lumpur-Singapore High Speed Rail and the Johor Baru-Singapore Rapid Transit System Link will open up business opportunities and draw our two peoples closer. Beyond physical links, we will also develop Singapore as a node in the global flow of data. We are renewing our HDB heartlands and investing heavily in new MRT infrastructure. Sustainable development will be a key consideration. We are making this a car-lite city, with vibrant public spaces and pathways for walking and cycling. We are working with Singaporeans to create a greener and better living environment, a City in a Garden. We will do our part to reduce carbon emissions. A far-reaching transformation of Singapore's cityscape will take shape in the coming decades. When Paya Lebar Air Base moves to Changi, it will free up an area larger than Ang Mo Kio for redevelopment. Moving the city ports to Tuas will double the size of the Central Business District. The possibilities in this new area - the Greater Southern Waterfront - are immense, and limited only by our imagination. With bold thinking, we will create a metropolis that embraces the future. Third, Singaporeans want our city to remain a nation of opportunities, where we can pursue dreams, chart fulfilling careers and lead meaningful lives. To achieve this, we are prepared to adapt to changing economic conditions, embrace technology, and continually upgrade our skills and knowledge. We will continue to renew the economy to keep it productive, enterprising and innovative. Our investment in research and development is bearing fruit, and will enable us to exploit deep technology and digitalisation; create a Smart Nation; and conceive, test-bed and scale up new products and services. This innovation ecosystem will strongly support entrepreneurship and further develop the start-up scene - in artificial intelligence, fintech, advanced manufacturing, bioscience and other areas. New business centres, such as the Jurong Lake District, Punggol Digital District and Woodlands North Coast, will each have their own character and industry niche. Companies will play a major role in economic restructuring. We will build a strong base of local firms with the capabilities to succeed both at home and abroad. Our enterprises must develop a strong culture of collaboration, especially when overseas. Singapore Inc must be a force abroad as much as it is at home. Finally, we will invest heavily in our people. In an age of technological disruption, Singaporeans must be flexible, eager to learn and adventurous to venture beyond our shores. We are changing the way we educate and prepare Singaporeans for life, putting less emphasis on academic grades, and more on skills and the ability to adapt to a dynamic external environment. SkillsFuture will anchor this national culture of lifelong learning for skills mastery. Adapt and Grow will match workers to jobs, and help them stay employable as industries and jobs change. Unions, employers and the Government must continue to collaborate closely. Tripartism has been an enduring competitive advantage for Singapore, and we have to continually nurture and strengthen it. Fourth, Singaporeans want to live in a fair and just society, one based on meritocracy, but at the same time strives to leave no one behind. Thus we are each prepared to do our best, but also to walk alongside fellow citizens who need help to keep up. In Singapore, people must always be able to get ahead through effort and excellence. We must open up more progression pathways and celebrate a broader range of successes. We are committed to giving every child a good start in life, no matter what their family circumstances may be. We will continue to raise the quality of pre-schools and do more for children at risk. We must tackle inequality vigorously. We need to provide the right additional support to those needing it - in housing, education, skills training and employment - so that meritocracy works well. Only then can everyone do well through hard work, talent and skills, regardless of their backgrounds. We need to pay special attention to the growing population of the elderly. We will continue to help older workers stay employed, earn fair wages and save more, so that they can age with dignity and purpose. We will enhance elderly friendly infrastructure, including new housing options and healthcare and fitness facilities. We will keep healthcare affordable through well-designed healthcare subsidies, MediShield Life, MediFund and enhancements to ElderShield. The Government will do its part to meet the needs of different segments of Singaporeans. It will provide more support to young families and make Singapore a great place to have children; help families cope with the cost of living; and enable persons with disabilities to lead full and active lives. Most importantly, we need to build a strong culture where the better-off devote time, talent and resources to help the less fortunate. Only when everybody lends a helping hand, can we truly become a compassionate and caring society. 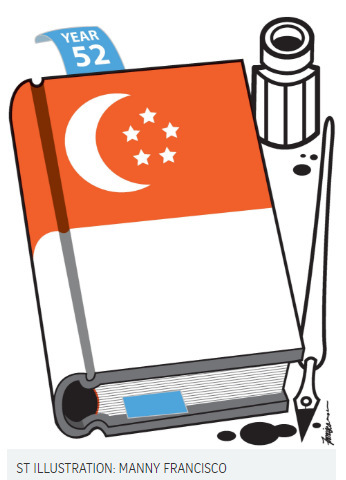 Above all, Singaporeans want to feel a strong sense of nationhood. That is why we are prepared to participate in and enlarge our common space, while preserving and practising our own ethnic cultures. The public housing estates brought communities together. Through the education system, we adopted a common working language in English. National service has become a key institution for nation building, and a major part of the Singaporean identity. By living and working side by side, going through ups and downs together, our diverse cultures and traditions are now interwoven. We did not expect this on Aug 8, 1965, but we have succeeded in nurturing a distinct Singapore identity, a sense of common destiny transcending our individual racial and religious identities. This is still a work in progress, but we have come far. The Singapore Bicentennial in 2019 - 200 years after Stamford Raffles landed in Singapore - will be an occasion to trace our roots and draw inspiration for the journey ahead. We will reflect on what it means to be Singaporean, and on the common values and beliefs that bind us together. In an uncertain and volatile world, leadership will continue to make a critical difference to Singapore. In responding to the challenges of their times, the fourth-generation leaders will work in concert with Singaporeans. A new generation of Singaporeans is coming of age. Their dreams, hopes and fears are different from those of their parents and grandparents. They dream of a bright future, and pour their energies into exploring fresh horizons and building a better world. They want to see their parents age well. They hope for a fairer and more equal society. As proud Singaporeans, they want to see this small island nation stand tall among the community of nations. Most of all, they are eager to take on responsibilities, participate in building and guiding Singapore, and step up to serve their community and country. The fourth-generation leadership must fire up and mobilise the spirit and energy of young Singaporeans. They must grow with the people they represent; embrace a diversity of views and ideas; and yet forge a clarity of purpose and unity of action. Their duty is clear, but the path will not be easy. There will be times of hardship, when they must demonstrate leadership and resolve. There will be moments of truth, when they have to stand firm on principles and ideals while seeking practical resolutions. They will need to listen to the views and feelings of the people and, by their words and deeds, show that they have heard; yet never fear to lead and mobilise public opinion to support difficult policies in the long-term interest of Singapore. This is how they will earn the right to lead. That right cannot be inherited. The trust between the people and their leaders is not automatically passed on from one generation to the next. In each generation the people and leaders must work with one another, go through trials and tribulations together, and forge their own bonds afresh. After 52 years, we are not done building our nation. The struggle for independence and the journey from Third World to First are gradually fading from our lived memories, as a new generation comes to the fore. Born and raised in post-independence Singapore, they must dedicate themselves to writing the next chapter of our story, understanding that becoming Singaporean - "one united people, regardless of race, language or religion" - continues to be an undertaking of conviction and choice. Together, the new generation will keep Singapore an exceptional nation. Redesign the Central Provident Fund (CPF) system so that Singaporeans no longer need to use it when buying homes. Allow driverless cars on the roads. Introduce a capital gains tax to reduce inequality. These were changes mooted by experts, non-governmental groups and former MPs, in response to a call by President Halimah Yacob for bold changes to help Singapore face a different future. 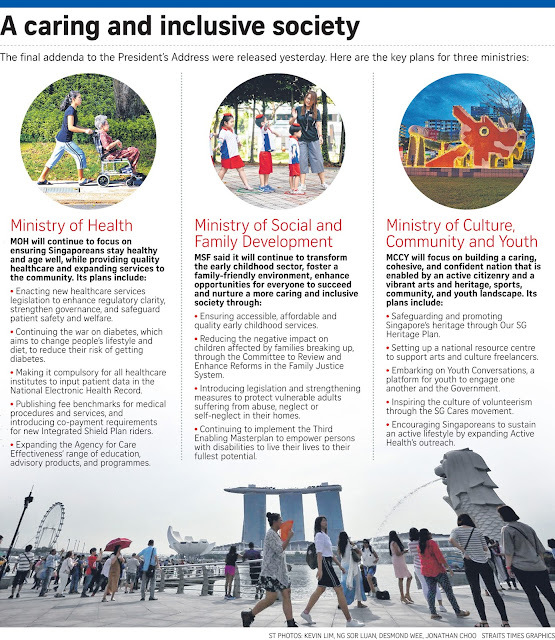 Her President's Address on Monday, drafted primarily by fourth-generation ministers, set out the direction which the younger leaders hope to take Singapore in. But that did not stop the wider society from chiming in with their ideas yesterday, when approached by The Straits Times. To ensure Singaporeans have enough retirement savings, a bold shift is to redesign the CPF system, so it is no longer used to pay for housing, said Singapore University of Social Sciences labour economist Walter Theseira. As part of that shift, CPF contribution rates can be cut, so that Singaporeans would have more take-home income which they are free to invest, including in housing, he added. Combining one's retirement assets with housing assets "works fine" if housing prices continue to rise - which may not be the case. The current system gets people to save through their homes, but this may be a source of concern as the value of homes may dwindle as they age, he said. One of the Government's priorities, said Madam Halimah, is forging a cohesive, caring and inclusive society. This involves paying special attention to a growing elderly population. To Dr Angelique Chan of the Duke-NUS Medical School, that includes helping their caregivers. Her bold idea is for the state to pay a caregiver allowance to children who quit work to care for their elderly parents, so their own retirement needs are not put at risk. "The idea that you shouldn't pay for filial piety is hard for policymakers to get over," she said. "But if caregivers weren't providing the care, these elderly people would be in institutions. That would cost the Government a lot more." In her speech, Madam Halimah also made tackling inequality a major priority for the Government. To that end, Professor Theseira suggested a capital gains tax, so that those who earn money from their labour do not end up paying a greater share of taxes than people who live off their investments. Meanwhile, advocacy group Association of Women for Action and Research called for a relaxation of public housing policy, so divorced parents may access rental flats without a 30-month debarment period. Unmarried mothers should also be allowed to form family nuclei with their children for the purpose of buying homes, it added. Another bold idea on reducing inequality came from National University of Singapore Department of Social Work Assistant Professor Irene Ng, who called for a rethink of the "universal basic goods" needed in the modern world. "In today's information world, being connected to the Internet has become a necessity. How about giving each household a free data plan and mobile device?" she suggested. 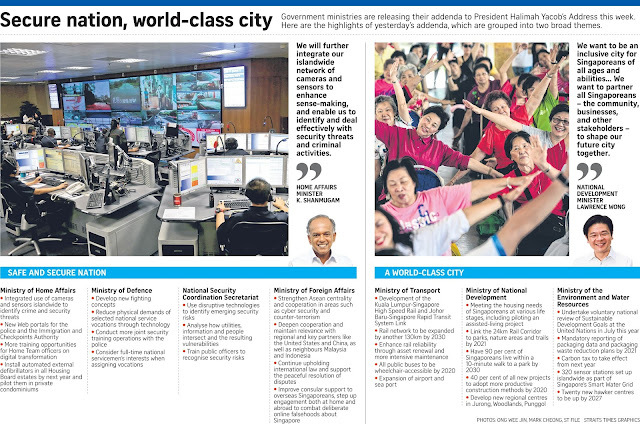 The President's Address also made it a government priority to build a world-class city. To do this, the fourth-generation leaders could be more proactive in embracing disruptive technology, said International Property Advisor chief executive Ku Swee Yong. One idea is to allow driverless vehicles on regular roads more quickly, and not just in pilot areas. This will require an upgrade to make the infrastructure ready for such vehicles, he said. Autonomous vehicles already ply the streets of several cities in the United States, including Washington, he noted. Mr Ku believes there is a reluctance to fully roll out driverless technology now because of the potential impact on the jobs of some 70,000 private-hire and taxi drivers today. There is a need to overcome this reluctance, he said. On forging a new economy with better opportunities for workers, another key point in the President's speech, former People's Action Party MP Inderjit Singh said that there could be a more fundamental change to the current economic model. "The core focus of our economic strategy should shift to local enterprises and SMEs (small and medium-sized enterprises)," he said, noting that multinationals could leave if economic conditions change. "If we help Singapore firms become big multinationals, even if they move to other countries to do their production, money will still be brought back here," he added. Singapore Computer Society council member Harish Pillay said the new leaders should place more emphasis on skills and less on academic degrees. His big idea involves incorporating computational thinking into the the primary school syllabus to help students think in logical steps and to develop problem-solving skills. Being open to bold ideas also means changing the way the Government listens to dissenting voices - including those from all quarters of civil society, said S. Rajaratnam School of International Studies Associate Professor Alan Chong. "The leaders should take a more inclusive approach towards civil society agendas and initiatives - they can help improve Singapore too."